A paralytic (sometimes called a muscle relaxant) is a category of medications that cause extreme muscle relaxation that renders most muscles of the body unable to move. According to Medscape: Succinylcholine, a rapid-onset, short-acting depolarizing muscle relaxant, has traditionally been the drug of choice when rapid muscle relaxation is needed. In certain cases, paralytics are used as part of general anesthesia, to prevent movement during surgery. If anesthesia just made the patient sleep, they would still be able to move during the procedure. This would result in serious issues for the surgeon, who is working with very sharp instruments on delicate areas of the body. During surgery, even the smallest involuntary movement, such as a muscles twitches, could cause a surgical error. Something like a sneeze could be catastrophic. For this reason, particularly for certain types of surgery, it is absolutely necessary that the patient never moves during surgery, with the exception of the movement necessary to breathe. Many paralytic drugs are based on a botanical pharmaceutical called curare. A plant native to South America, it was originally used to paralyze animals during the hunt. By the mid-1940s, curare was being used as an adjunct to anesthesia. Starting in the 1950s, researchers began creating synthetic paralytic drugs. While these were useful in surgery, many had disadvantages such as slow onset or unpredictability. Paralytic drugs relax the muscles to the point where it impossible to use most of the muscles of the body. The muscles of the diaphragm, which help the lungs fill with oxygen, are also unable to move, so it is impossible to draw a breath. Once the paralytic medication is given, the ventilator and a breathing tube are necessary. This type of medication is given through an IV and is only available in hospitals and surgical facilities. Patients must be closely monitored, and the dosage must be carefully selected. Even with appropriate use and careful monitoring, side effects can occur. Some common side effects include fast heartbeat, fast breathing, dizziness, headache, chest pain, and increased body temperature. When surgery is complete, a medication is given to reverse the effects of paralytic drugs. Examples include acetylcholinesterase inhibitors, neostigmine, and edrophonium. As with paralytic drugs, dosage must be appropriate to avoid negative side effects. Paralytics only keep the body from moving; they no impact on pain or memory. 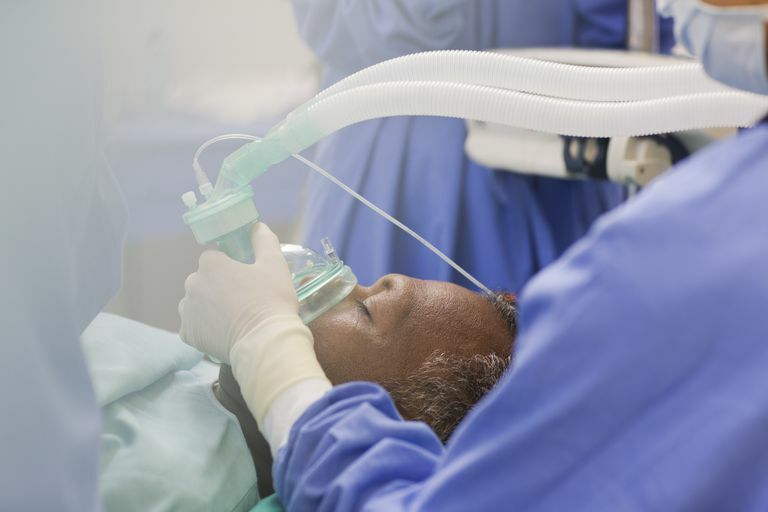 Without sedation, the patient would be wide awake during surgery and unable to move. For this reason, sedation is also given during surgery to stop patients from experiencing pain or remembering the experience of the surgery. It is the combination of the sedating medications and the paralytic that make general anesthesia successful for many surgery patients. Press, Christopher. General anesthesia. Medscape. Web. Raghavendra T. Neuromuscular blocking drugs: discovery and development. Journal of the Royal Society of Medicine. 2002;95(7):363-367.